25 years ago Greg and I were youth pastors in a few different places. One of them was Jeannette, PA. 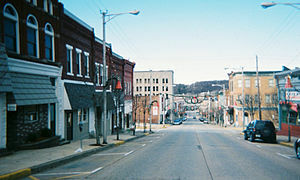 The picture to the right is the downtown of Jeannette. We were blessed with sweet memories – a crazy, fun small group of teenagers that were like our very own kids – even though we weren’t much older than they were! Lately I’ve been blessed to find my ‘lost boys’ and connect with them again on Facebook. One even found me because of my blog! I’m so glad for these means of finding people today in our world. Still looking for the girls! I also had coffee this morning with my dear friend, Deanna. She is the kind of friend who just loves me – doesn’t judge me or lecture – just loves. It is powerful to have these kind of friends in our lives. She is an example of God‘s richest blessings. I was thinking about finding the ‘lost boys’ of my past – and today having rich friendships – and it made me wonder if heaven will be a little bit like this. Reunions of the heart and mind with people who are dear to us – that have been removed for a time. What a day that will be – to ‘connect’ with all of them again! Some who have gone on before – or some that for a number of reasons – are not ‘connected’ with me right now. In heaven – there will be no more tears, sadness or separation. We will be able to hold those we love – in a warm embrace. It will complete our lost and empty feeling that we feel in relationships gone wrong here on earth. And the Bible says, “He will wipe away all our tears” – and I believe it. I’ve had a ‘little’ taste of heaven down here – with my wonderful friends – and with my blessing of finding something that was once lost – and now is found. Greg and I have some very fond memories of a youth group that we were in charge of as youth pastors in Jeannette, PA for one year from 1985- 1986. We had already had a previous youth group in Juneau, Alaska when we were fresh out of Bible School – from 1983-1984. Wow. Was it EVER a learning experience for us – not too many fond memories of that place – but there were a few kids from the youth group that have followed us as we have lived around the country. It was a hard first experience in the ministry and we found ourselves “wanting out” for a season – so we took an entire year off and moved to Fairbanks where Greg is from. When we were settled there and in secular jobs (making really good money) we had an encounter with a pastor from Jeannette, PA and he was looking for a youth pastor. We were pretty sure we didn’t want to do that again – but he was so kind and generous to us – had us flown to PA to look it over and meet the kids – and after praying about it and weighing our options we decided that it was the right thing to do. It is a year that we will never forget – for many reasons – but I would say that working with LaVerne and Beverly Clute (the senior pastor and his wife) was a rich and wonderful experience that we will never forget. They taught us what it was like to really love and care about people. They became like our parents and we had many good times at their house. And for those of you that enjoy classic rock – here’s a song from 1985 “Addicted to Love” that our youth group in PA used to listen to and these lyrics just used to CRACK us up!!! Many good times! Be kind – this was 1985 and the kids in the youth group loved this stuff!